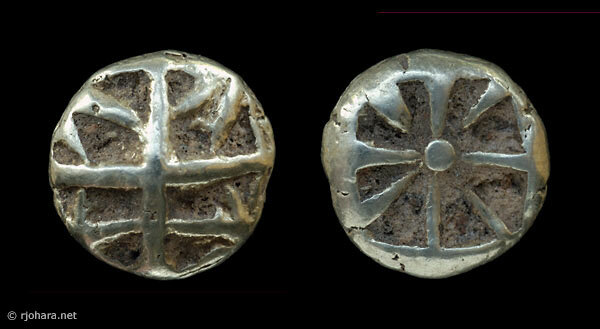 These coins constitute one of the most mysterious and enigmatic series from the Archaic period. They are often referred to as “geometric” issues and the obverse design is sometimes called a “collapsing square” in the literature. They have been described as the first coins ever made with both an obverse and a reverse type (as opposed to a simple incuse reverse), and the degree of wear many of them exhibit suggests that they were long in circulation. Even though they were minted in at least six different denominations (Table 1), and must have enjoyed considerable use, very few examples are known to have survived. The weight standard they follow (the Lydo-Milesian, based on a stater of 14.1 g) is the only clue we have to their place of origin. They probably date from the first half of the sixth century BC. Table 1. Published examples of the geometric electrum series. Kayhan 698 (2.30 g) [ = CNG 49.573 (1999)]. Described as Kayhan 697, but obverse shows additional crossed lines. Zhuyuetang 3 (2.37 g). Described as Zhuyuetang 2. 1/12 stater Kayhan 699 (1.14 g) [ = CNG 49.574 (1999)]. Obverse: “geometric design consisting of an irregular square crossed by two lines.” Reverse: “square incuse divided into eight triangular compartments” (or, a central dot with eight radiating spokes). Kayhan 700 (1.15 g) [ = CNG 53.478 (2000)]. Described as Kayhan 699. 1/24 stater Rosen 279 (0.537 g). Obverse: “geometric pattern.” Reverse: “incuse square consisting of seven spokes, striations, and central dot.” The reverse is noted to be similar to Rosen 285, also an EL twenty-fourth (0.593 g) with seven spokes emanating from a central dot, but in this case the obverse is a lion’s paw seen from above. While Rosen 279 is described as having seven spokes, from the (very small) illustration it looks as though it may in fact have eight, as in Kayhan 699, and it also shows similar short connecting lines. Kayhan 701 (0.57 g) [ = Tkalec 29-02-2000.106]. Described as Kayhan 699 and 700 with same obverse die as Rosen 279; illustration shows reverse with eight spokes radiating from central dot, and two small connecting lines. Zhuyuetang 5 (0.56 g). Described as Zhuyuetang 4. 1/48 stater Zhuyuetang 6 (0.29 g) [ = Tkalec 29-02-2000.105]. Described as Zhuyuetang 4. Publication note: Eric McFadden (2002) has recently summarized current knowledge of the geometric electrum series in a report on a large hoard of these coins that appeared on the market in 1997 (and from which the specimen below almost certainly came). The conclusions in his paper, titled “A hoard of early multi-denominational electrum coins,” have not yet been incorporated here. Additional note: A group of these coins was offered for sale in CNG’s Triton X catalog (8 January 2007), including the second known stater (Triton X.318). Information from the descriptions in that catalog has not yet been incorporated here. Additional note: The third-known stater from this series was offered for sale by CNG in December 2007 (Triton XI.245, closing 7 January 2008). Information from the description of that coin, which was said to be from the same dies as the previous two specimens, has not yet been incorporated here. The twelfth staters in this series differ from the twenty-fourth staters in having a more pronounced central pellet on the reverse. RJO 47. Electrum 1/12 stater (1.26 g), about 600–550 BC. Obverse: “collapsing square” with two cross lines. Reverse: central pellet with eight radiating spokes.